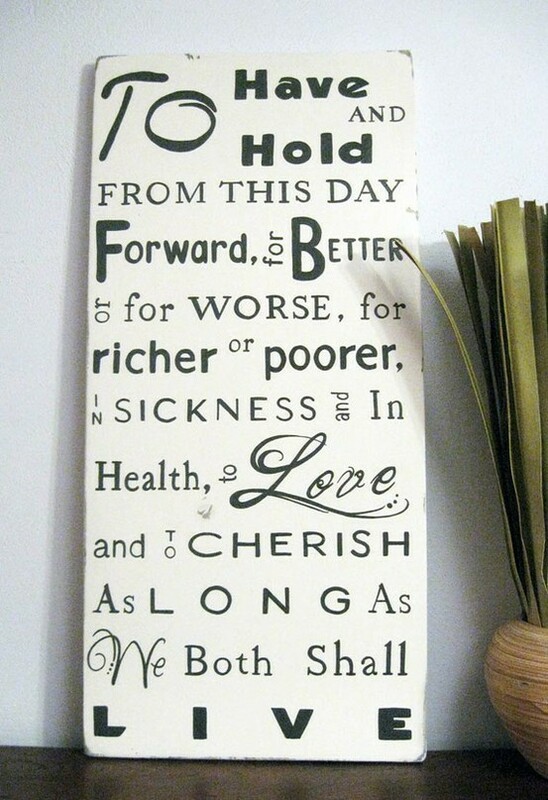 Your wedding day is the one day you promise to love each other and make your vows to each other. 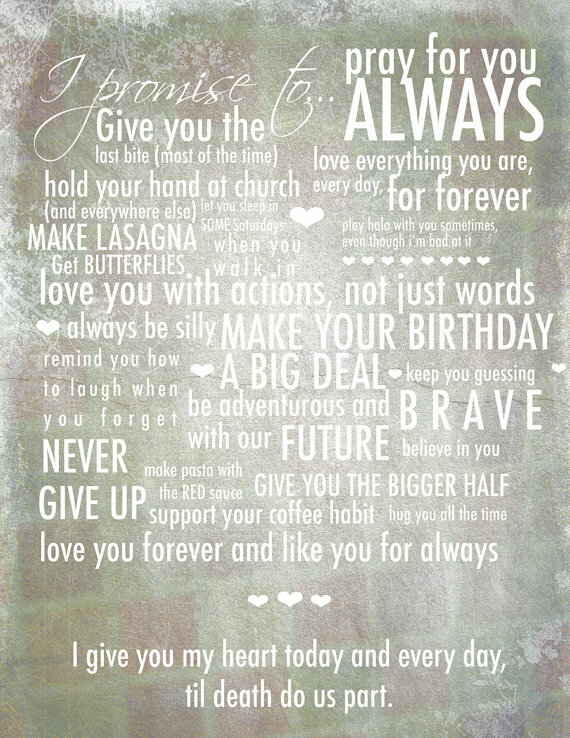 Try to make your vows more personal so that they have real meaning to you both. There is nothing quite so moving as a bride or groom speaking their vows to each other and being overcome by the emotion and importance of the words they are saying. That break in the voice as the groom's throat constricts and he is overwhelmed with love as he offers his bride his love and devotion is one of the most memorable moments of any wedding. It would be hard not to love the idea of beautifully written verse and deep and meaningful words spoken in mellifluous tones but don't be put off if you are not a fan of classic literature and don't use words you don't fully understand. All, that will happen is that you will feel foolish and the sentiment will be lost. Don't be afraid to include a particularly poignant song lyric or quote from a favourite film, book or poem if it has meaning for you. "You had me at hello" is just as romantic as anything by Keats or Byron if it means something to you both. Incidentally, there is nothing wrong with promising to wash the dishes or cook the dinner either! Just make sure you mean it. 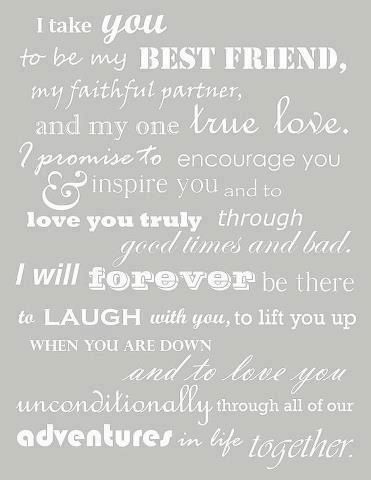 Below are two suggested ideas for wedding vows but don't just copy them add your own words, change things around and make them your own. I will hold you close in my arms and laugh with you when you are joyful. I will prize you above all others and remain faithful to you all the days of our lives. 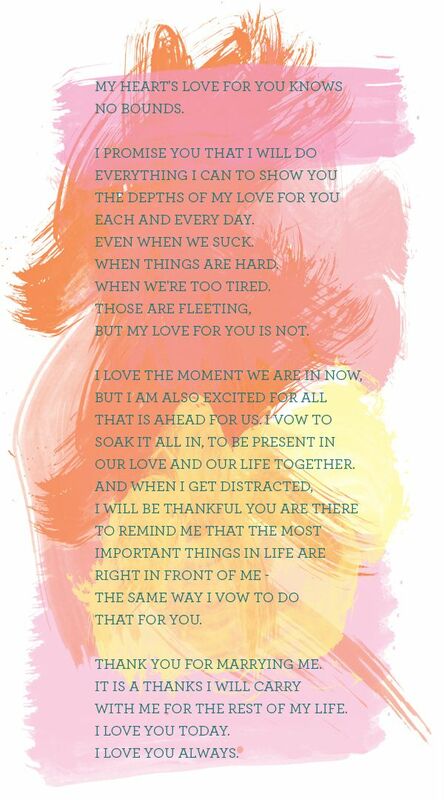 Although this is short it sums up the whole idea of marriage as a joining together of hearts and minds. The second idea follows the more traditional line of making a series of promises. I will share you with your family and friends. I will celebrate with you when you are joyous. There is no where I would rather be than at your side.